The Sonoma Hot Air Balloon Classic is Back! Windsor’s Keiser Park will be hosting the Sonoma Hot Air Balloon Classic on June 9-10. This celebration features over 20 balloons – all shapes and sizes! We’re excited to check out the Napa Valley balloons that will be there as well as some funky display balloons from out of town. We’ve said it before: a hot air balloon Napa experience starts early in the morning. Therefore expect these balloons to start flying high during sunrise, which is the best time for hot air balloons due to weather. But what makes these balloons different than your average Napa Valley balloons? For starters, the shapes. Picture a giant Darth Vader, Liberty bell, and Humpty Dumpty soaring high above. The festivities begin at 5:00am as the burners fire up, creating a strong glow throughout the grounds. The launch begins at 6:00am, so look up and see these funky balloons fly! These hot air balloons are more for display than for guests (unlike our Napa Valley balloons), so after the balloons land, only tethered hot air balloon rides will be offered. Although this is different from hot air balloon Napa rides, we still recommend attending and hopping on because these unique balloons are rarely available throughout the year. The Sonoma County Hot Air Balloon Classic is a non-profit event run by volunteers. 2018 marks the 28th year of the fest! You’ll find 20,000 people attending! And this year, the event is dedicated to victims of the wildfires and first responders. Funds support charity events by Civil Air Patrol, Boy Scouts, local high schools, and rotary club. Visitors can expect great food vendors, amazing wine and beer selections, and an envelope activity, where you get to essentially climb into the colorful balloon. 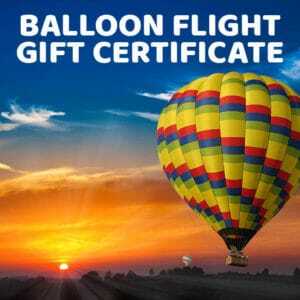 In that case join Balloons Above the Valley for an actual hot air balloon Napa adventure! This untethered flight soars through the skies of Napa Valley and creates long-lasting memories. Browse our many Napa Valley balloons flight options such as hot air balloon Napa experience consisting of an amazing balloon ride. Check out the brunch package which includes a hot air balloon Napa ride followed by Michelin-awarded Champagne brunch. We also have wine tour packages with brunch and hot air balloon Napa rides, as well as a San Francisco transport + wine tour + brunch + hot air balloon Napa adventure! We hope to see you at the Sonoma Hot Air Balloon Classic and on one of our Napa Valley balloon rides! This hot air balloon Napa adventure just got a whole lot better!